Well, you might find it surprising, but I’m going to tell you that you can expect to see a return on investment (ROI) from as little as $5 per day! Even if you only have a small budget, it’s important to advertise EVERY DAY. Once you’ve got people following your Facebook page, you can now start to re-direct them to your website. “But how do I do that?”, you ask. There’s a couple of ways, but a good lead magnet will almost always yield the best results. Give people a reason to go to your website, and more importantly, to sign up to your list. It doesn’t need to be complicated! Keep it Simple. You could offer new subscribers a one-time discount or special offer, or even just the promise of the latest and the greatest news and events. Make it interesting, fun and you will have people signing up before you know it. If you don’t know where you are going, how will you know when you get there? Work out what your main goal is and focus on that only. Is your goal to promote your Facebook Page, build your subscriber list or promote your blog? Pick a goal and stick with it for at least 4 weeks. Switching things up too frequently won’t give you enough time to establish a baseline, review the data, tweak, and yield results. Even though I’ve just told you to ‘stick with it’ doesn’t mean you should pour money down the drain on something that isn’t working. You need to stick with one main goal, but how you advertise to yield results will almost always take some trial and error. If something isn’t working, try attacking it from a different angle. Try tweaking your ad towards a different audience, change up your graphic art or your advertising hook. Don’t keep spending money on something that isn’t yielding results. I will add a caveat to this however, let your ad run for at least 48 hours before you make any decisions about switching it up. You really can’t tell in the first 24 if your ad is not performing. Sometimes it just takes a day or two to get the ball rolling. Lastly, if you are working with a small budget, Make It Count! Don’t rush your ads, or just throw up any old, blurry image with text that looks like you created it on MS Paint. 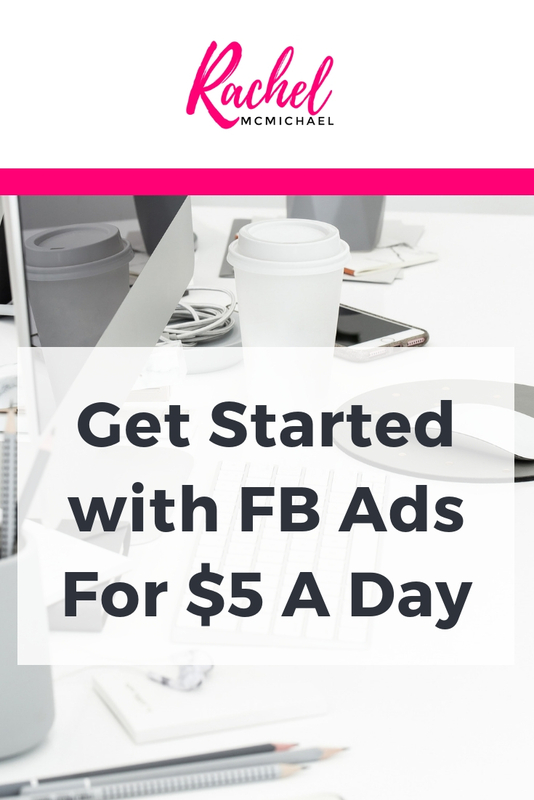 If you want your $5 to convert then you are going to need a decent ad. The ads manager has several incredible images to choose from, and a great image paired with compelling copy shown to a well-targeted audience and sent to a well-crafted offer is a recipe for ads success!